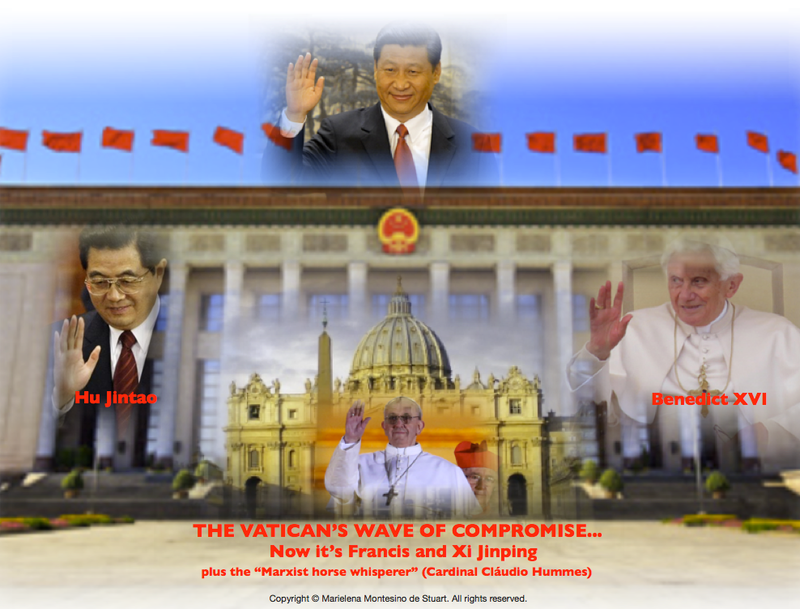 THE BEIJING AFFAIR (Part Three): The Vatican, Communism and China… who’s heard your confession lately? | © Marielena Montesino de Stuart. All rights reserved. THE BEIJING AFFAIR (Part Three): The Vatican, Communism and China… who’s heard your confession lately? Do Catholics in the United States and other parts of the world care about the Vatican’s compromise with Beijing– and its tragic consequences? A dangerous “dialogue” with Communism has defined the Catholic Church in modern times. What will become of the faithful in the Underground Catholic Church in China, who refuse to “dialogue” with their Communist captors? “Compromised” priests from the CCPA (the Communist Party-controlled organization of the compromised Church in China) began arriving in the U.S. more than 20 years ago. … who’s heard your confession lately? Aloysius Jin Luxian left this world on April 27 at the age of 97, as the “bishop” of Shanghai who had served two masters: the Communists in Beijing and the Vatican. His life followed the path of a typical former political prisoner who accepts being “reeducated” by his captors– then proceeds to be of service to the Communist Party. Jin seems to have ignored the fact that it is sacrilegious for a political prisoner to use Christ as the excuse for submitting himself to reeducation by his Communist captors. The architects of the current “rules of conduct”– known as the Second Vatican Ecumenical Council (Vatican II) which launched the modernist revolution in the Catholic Church between 1962-65, specifically refused to condemn Communism. This has been the “elephant in the room” that many Catholics have tried to avoid discussing for more than 50 years– for fear of being called “disobedient” and “extreme” by their priests– as well as by the powerful Vatican II lay movements that surround them. But history has a way of catching up with society– and more Catholics are now paying attention– and are willing to step forward, in order to confront this grave situation, as they witness the United States and the rest of the world succumb to socialism. This monumental shift that took place in the Catholic Church between 1962-1965 did not happen overnight. Vatican II’s refusal to condemn Communism was simply the apex of decades of revolutionary activity by modernist prelates, philosophers and fellow travelers. In spite of this subversive element, the Catholic Church continued its condemnation of Communism– until Vatican II came along; thereafter, the modus operandi has been to ostracize and isolate anyone who dares to speak or write about the modernist Vatican and its refusal to confront this evil. A perfect example is Dr. Romano Amerio (†1997)– who was a professor at the Academy of Lugano, a consultant to the Preparatory Commission of Vatican II from 1960-62, and an adviser at the Council. In other words– Romano Amerio was a willing participant and insider at Vatican II. One should ask why Amerio, a philologist and philosopher, at the mature age of 55– and with extensive contacts in the Church, chose to participate in the Vatican II preparatory commission between 1960-62, and as an adviser at the Council. At that point in his life his participation at the Council, as a lay Catholic, cannot be blamed on anyone– given the chaos he later exposed. I’m sure that Dr. Amerio felt better, after revealing his misadventures in Vatican II. May he rest in peace. Undoubtedly, in any historic event where duplicitous tactics were used, it is best to quote from insiders who are willing to come forward as witnesses, with access to the documentation and the major players. The colossal betrayal of the Church and humanity by Vatican II is the perfect example. So as a Roman Catholic, my focus remains on finding the most effective ways of presenting the path of destruction of Vatican II– and its betrayal of the One True Holy Catholic and Apostolic Church, and her traditions. In his book titled, IOTA UNUM: A Study of Changes in the Catholic Church in the Twentieth Century, Dr. Amerio chronicles the indefensible events that took place during the Vatican II sessions, with the added benefit of having had access to thousands of documents and records. In IOTA UNUM he also describes the meeting held in the town of Metz, in France, which was arranged by Vatican officials and officials of the Orthodox Church from the former Soviet Union. A meeting which has defined the Church’s “dialogue” with Communism. A dialogue which continues, with tragic consequences, in the 21st Century. “When one is talking about the liberty of the council, the salient and half secret point that should be noted is the restriction on the council’s liberty to which John XXIII had agreed a few months earlier, in making an accord with the Orthodox Church by which the patriarchate of Moscow accepted the papal invitation to send observers to the council, while the Pope for his part guaranteed the council would refrain from condemning communism. The negotiations took place at Metz in August 1962, and all the details of the press conference were given by Mgr. Schmitt , the bishop of that diocese. The negotiations ended in an agreement signed by Metropolitan Nikodim for the Orthodox Church and Cardinal Tisserant, the Dean of the Sacred College of Cardinals, for the Holy See. News of the agreement was given in France Nouvelle, the central bulletin of the French Communist Party, in the edition of 16-22 January 1963…” [followed by newspaper quote]. “On the Catholic side, the daily La Croix of 15 February 1963 gave notice of the agreement…” [followed by newspaper quote]. Given the world’s capitulation to socialism, the results of the Vatican’s failed modernist policy towards Communism are finally being examined, particularly with regards to China and Cuba. Now more and more Catholics are willing to discuss this matter– lest they risk being listed as collaborators with those who choose to cover-up or ignore history. The key element of the meeting at Metz was the KGB (Committee for State Security of the former Soviet Union). Cardinal Eugène Tisserant had become a consummate Vatican insider, by the time that the planning of Vatican II was set in motion. Tisserant had served in various dicasteries, worked as an Archivist at the Vatican’s Secret Archives and as a professor at the Pontifical Roman Athenaeum S. Apollinare. He was a polyglot– and a former intelligence officer in the French Army during World War I. In addition, he served as Dean of the Sacred College of Cardinals. Tisserant became the first Vatican II Council President. At Metz, Tisserant effectively entered into an agreement with the KGB by way of Patriarch Nikodim of the Soviet branch of the Orthodox Church. To assume that the Vatican went into this agreement with naiveté, is to ignore the fact that the Vatican is one of the world’s most powerful and influential entities, when it comes to diplomacy and communication with religious leaders, heads of states and foreign ambassadors– with the ability to dispatch emissaries and nuncios to just about every corner of the planet. This refusal to condemn Communism was also described by another insider– Fr. Ralph M. Wiltgen, S.V.D., who in 1962, at the age of 41, became the founder of the Council News Service, which gave him in-depth access and exposure to the key players of Vatican II—as well as to thousands of documents and communications, during the 281 days that the Vatican II Council was in session. Father Wiltgen, who was also a polyglot, wrote daily news reports in six languages, covering the proceedings of the Council. In The Rhine Flows into the Tiber, Father Wiltgen offered an account of the twisted way in which every attempt to have Communism condemned by the Vatican II Council, was consistently undermined. The refusal to condemn Communism in the crafting of Vatican II, has defined the modern Catholic Church— and has aided and abetted the spread of Communism. This has been manifested through Liberation Theology and other Marxist-inspired movements, which have found a home in the “dialogue” of modern Catholicism. In the meantime, Vatican officials have refined the art of doublespeak— by making proclamations against Marxism as an ideology— while allowing Marxist priests and prelates to remain active. 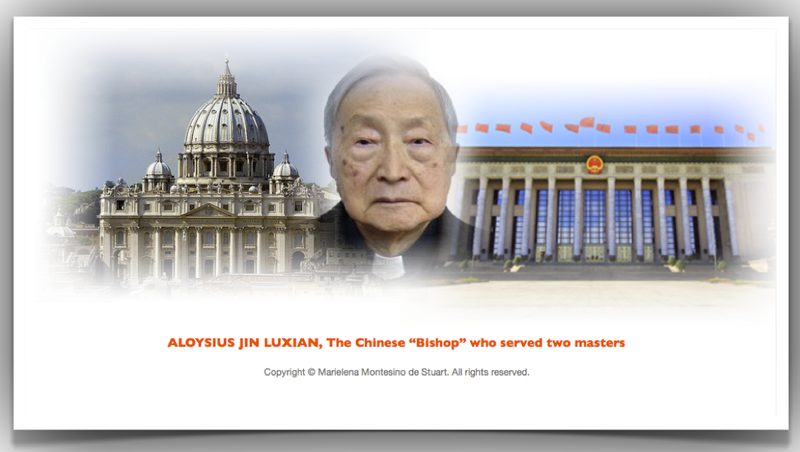 So in more ways than one, Aloysius Jin Luxian, the Chinese “bishop” who served two masters, was fulfilling Vatican II’s objectives. Jin entered into a rather late agreement with the Holy See in 2005, when it was safe for him to do so– after his long membership in the Communist Party-controlled Chinese Catholic Patriotic Association (CCPA)– which does not recognize the Pope’s authority. In the meantime, CCPA priests have been on the ground in the United States for more than 20 years. Who’s heard your confession lately? The CCPA actually has a lot in common with many modernist Catholic Bishops and Cardinals– who, for example, did not recognize Benedict XVI’s authority when he issued a Motu Propio regarding the Latin Mass– which ended up in the trash bins of many prelates all over the world– including the United States. These anarchic Bishops and Cardinals (again, some of them right here in the U.S.) also do not recognize the Pope’s authority when it comes to the rules of the Congregation for the Doctrine of the Faith– as they flagrantly persist in allowing homosexual groups to hold meetings and gatherings on Catholic Church property. Cardinal Timothy Dolan in New York is a perfect example of this problem, as I will further explain below. What do Vatican officials do when the Pope’s authority is not recognized by prelates all over the world? This compromise starts with the person elected to sit on the Throne of Peter. Soon after, one can see members of the Church’s hierarchy making anti-gay marriage and pro-life exhortations in front of television cameras, to appease unsuspecting faithful Catholics– so that donations keep pouring in. This environment has led to very low expectations on the part of many Catholics– who are actually in awe of pro-life and pro-traditional family statements made by priests, Bishops, Cardinals (and even Francis)– without paying attention to what is really going on backstage, in the modernist Catholic Church. Imagine that, Francis has strong pro-life views! The list is endless, when it comes to examples of prelates not recognizing the authority of the Pope– in the modernist Church of Vatican II– which truly represents the chaotic nature of the Second Vatican Council. Aloysius Jin Luxian found shade during the last years of his life under the Holy See’s umbrella, by finally agreeing to follow Rome’s authority. This was a pragmatic move by Jin for his “Catholic legacy”– after years of faithful service to the Communist Party in China. What Jin did not know is that there was no need for him to do a crossover. By 2007, the Vatican, which had been in “dialogue” with Communists for years, caved in and openly compromised with Beijing. Jin’s career as a Communist Party-approved “bishop” is well known. His betrayal of the Chinese citizens who became martyrs in the Underground Catholic Church had been the subject of much handwringing by prelates in the Vatican. For years, these modernist prelates in Rome have sat on the fence with progressive “philosophers” and “intellectuals,” eating hefty meals and ruminating on what to do about persecuted Catholics– but not the Chinese type. 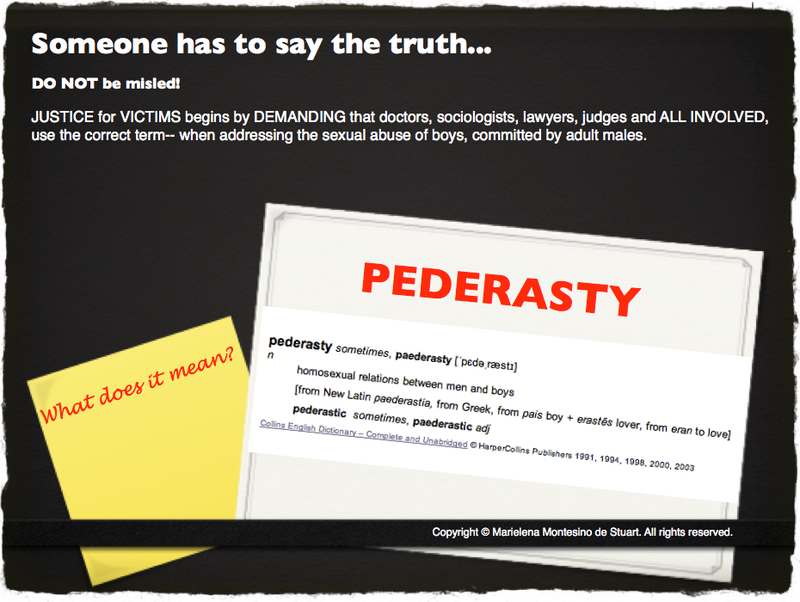 These prelates have another type of persecution in mind. They consider themselves to be “the” persecuted ones– and care more about making sure that there is plenty of money to support their gluttony and their cover-up of crimes committed by pederasts who have colonized like bacteria, in the Church. But how dare anyone question the “service” of these prelates! They also have no remorse in taking every precaution, so that homosexuals are well represented in the Church– and will spend precious money donated by the faithful to support these endeavors, in violation of Church laws, including the rules set forth by the Congregation for the Doctrine of the Faith. These violations are pervasive and persistent in the modernist Catholic Church– and have turned the Vatican into an almost lawless and anarchic organization. Where are the holy men? In the meantime, the number of martyrs loyal to the Holy See keeps mounting in China and in other parts of the world, including Cuba. Is the Secretariat of State purposely misleading the public? I have no tolerance for individuals like Aloysius Jin Luxian, nor for Vatican statements honoring him, such as the press release issued by the Secretariat of State, led by Cardinal Tarcisio Bertone (available here in English and here in Italian). Whenever possible, I provide documents in the original language, since much can be lost in the translations issued by the Vatican. For example, the title of the press release was not even translated– which immediately misleads the reader. “La morte di mons. Jin Luxian, figura eminente della Chiesa cinese.“ TRANSLATION INTO ENGLISH BY MARIELENA MONTESINO DE STUART: “The death of Monsignor Jin Luxian, eminent figure of the Chinese Church” [bold added for emphasis]. There is plenty of reason behind my lack of tolerance for the scenario presented above, both from the standpoint of Jin’s actions and the Vatican’s reaction. I grew up watching members of my family– who were political prisoners in Communist Cuba, refuse to be “reeducated” by the Communist regime. Their refusal to enter reeducation camps led to even more torture. Their sacrifice was an enduring gift to me—which strengthened my formation as a Roman Catholic, growing up in an official atheist Communist state. In 2007, while Benedict XVI was receiving much attention from lay Catholics for his Motu Propio on the Latin Mass– he quietly slipped a shameful letter to the persecuted members of the Underground Church in China, asking them to cooperate with the compromised Church controlled by the Communists. The members of the Underground Church were dismayed and in disbelief– and reports indicate, for the most part, that they still refuse to be controlled by the Communist Party thugs. Vatican officials and vaticanisti have tried to spin and justify, time and again, the terrible betrayal expressed in Benedict XVI’s letter– and the unwillingness of the Underground Catholic Church to submit to compromise with the Communists. Every excuse has been made– including “the letter was not read, or understood,” or “it was not properly translated into Chinese,” etc. Actually, it appears that most members of the Underground Catholic Church in China did understand Benedict XVI’s letter– and THEY DID NOT LIKE IT ONE BIT. Almost six years later, the Underground Church remains exactly where it has always been. I consider the “quiet” release of Benedict XVI’s letter in 2007, involving such a grave situation for the Underground Catholics in China, to be one of the most reprehensible actions to come out of the Vatican in recent years– taking into account that these persecuted members of the Underground Church are isolated from the world and deserve the full attention and support from Catholics everywhere. Of course, these modernist Church officials in Rome are experts at speaking out of both sides of their mouth– and know how and when to downplay their activities involving “dialogue” and “compromise” — so as to keep unsuspecting Catholics bewitched, bothered and bewildered. Having lived under Communism in Cuba, I am much too familiar with these games. So here we have the Underground Catholics in China, who have risked their lives by embracing the Cross and remaining loyal to the Holy See, being told to cooperate with the Communist Party. Benedict XVI proceeded to add a Compendium in 2009, letting the members of the Underground Catholic Church know that he was serious– and that they needed to reconcile with the compromised Church. No ifs, ands or buts about it. 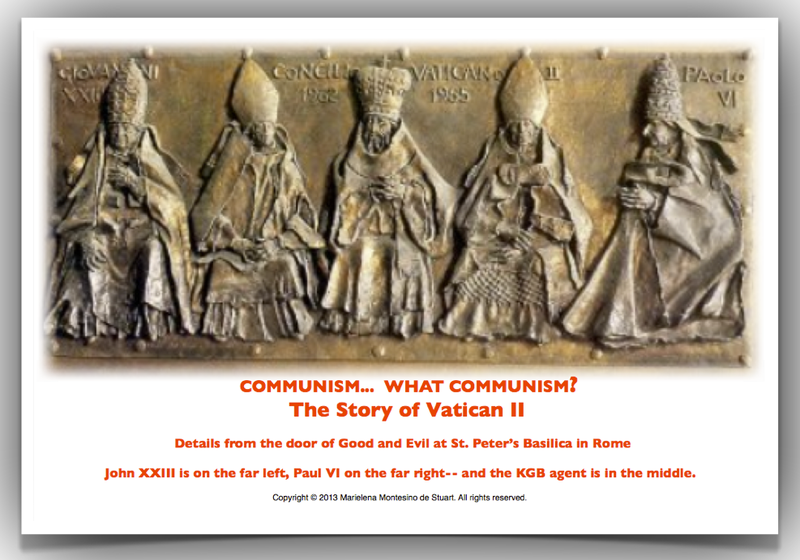 In both the 2007 letter and in the Compendium, the Second Vatican Council (Vatican II) is cited time and again– but the word Communism is never mentioned. This is consistent with the rules of Vatican II. Imagine the betrayal felt by these faithful Catholics– as they are told to “dialogue” with their captors! “‘Therefore the Second Vatican Council underlines that “those also have a claim on our respect and charity who think and act differently from us in social, political, and religious matters. In fact, the more deeply, through courtesy and love, we come to understand their ways of thinking, the more easily will we be able to enter into dialogue with them’“. [Bold added for emphasis]. The Communists in Beijing have reacted by issuing even stricter marching orders for the Vatican— and by intensifying their persecution practices. Cardinal Fernando Filoni, who was confirmed by Francis in March 2013 as the Prefect of the Congregation for the Evangelization of Peoples, wrote a long reflection on October 22, 2012, titled Five Years after the Publication of Benedict XVI’s Letter to the Church in China. The Vatican’s absurd expectation of “mutual trust” and “equal dignity” when dealing with Communists shows the duplicity of these Vatican officials. When did Christ ever say that we have to “dialogue” with Satan? Cardinal Filoni actually has the nerve to refer to the dialogue between the Vatican and the Communist Party, as the dialogue between the two “Currents.” Calling Communism a “current” is an insult to the members of the Underground Church in China, who are being tortured and murdered for refusing to cooperate with the Communist Party, and have remained loyal to the Holy See. Essentially, the Vatican is calling for more of the same failed policies. In Five Years after the Publication of Benedict XVI’s Letter to the Church in China, Cardinal Filoni actually makes the “brilliant” statement that “China is a huge country and the Chinese people are everywhere”—but he forgets that most of them are in China — and they are facing horrific oppression, especially those who refuse to cooperate with the Communist Party, as a reaffirmation of their faith in Christ. Cardinal Filoni also forgets that China’s powerful political and economic presence is “everywhere” as well— and that means in every continent. Beijing’s determination to influence public policy is right here in our own southern backyard, through a “pact” with the Venezuelan government that allows the Chinese Communist Party to train Venezuelan ruling party leaders. This of course, is in addition to the well-established presence of Cuban officials in Venezuela, most notably the “Strategic Cooperation Team” led by a Cuban general. So this statement that “Chinese people are everywhere” represents more of the empty rhetoric being spoken by modernist Vatican officials when it comes to China, as they continue to “examine” the “global community”— instead of confronting Communism head on, calling it by its name and denouncing its atrocities. Benedict XVI, Francis and Cardinal Fernando Filoni could learn a lesson of courage from Pope Innocent IV– who informed the Tartars that he was the man in charge, that they had to stop killing his holy Christian missionaries– and that they needed to be baptized. This not only showed that Innocent IV had courage– but also determination in the sacred propagation of the faith. “The Lord has redeemed all of us, all of us, with the Blood of Christ: all of us, not just Catholics. Everyone! It looks like Cardinal Filoni will soon be out of a job, at the rate Francis is going– since there does not seem to be a purpose for the Congregation of the Evangelization of Peoples. This may shorten the pain for the Congregation of the Evangelization of Peoples, which has already proven to be in a dysfunctional state. In the meantime, back in China, is does not look like the members of the Underground Catholic Church will be meeting “there” –or “anywhere,” with their Communist atheist oppressors. Read Francis’s May 22 homily here in English and here in Italian. Also provided by Vatican Radio here. Here is the AUDIO recording of Francis’s May 22 homily from Vatican Radio: https://romancatholicworld.files.wordpress.com/2013/06/22pope22-francis-may-22-2013-homily-at-sancta-marthae-130602_001.mp3 God help us. The fact that the architects of Vatican II specifically omitted any condemnation of Communism, choosing instead an off-the record “dialogue” approach, is extremely important for the entire world to understand– because it affects Catholics and non-Catholics. This cannot be emphasized enough. This “dialogue” fits Francis like a glove– but it will be challenged by the faithful in the Underground Catholic Church in China– who have witnessed the martyrdom of their family and friends, yet they continue to care for the wounded, the rejected and the unborn under the most horrific environment of persecution. Well over 12 million Catholics in the Underground Church in China are under threat from the Communists in Beijing—and are waiting for a word from Francis. They are expecting more than a simple ‘Nín hǎo’ (hello) — particularly because Beijing continues its relentless and violent persecution of those who refuse to attend churches run under the Chinese Catholic Patriotic Association. The reality is that little can be delivered by the Vatican to affirm its supremacy under the present Vatican II “rules of conduct”– so faithful Catholics in the Underground Church in China must truly wait for a miracle. A miracle which Francis is not likely to deliver, based on his love of “dialogue”– and the fact that he will not go against his predecessor, who lives a hop, skip and a jump from him, in the Vatican. It is expected that Francis will follow a compromise similar to the Ostpolitik position of the Vatican towards the former Soviet Union— through a “shared leadership” with the Communist thugs in Beijing. But this “sharing” of leadership could be even more dangerous with Francis, since he is widely known as “the Pope who is reluctant to be Pope.” The Communists bureaucrats at the Chinese Catholic Patriotic Association will be delighted to take the lead– and will continue to appoint their own “bishops”– who will eventually get a quiet nod of approval from Francis. Cardinal Zen is well known for going along with the “dialogue” program from the Vatican– and for defending Benedict XVI’s “compromise” approach. Yet, Cardinal Zen has also acted as a defender of the Underground Church. The Community of Sant’Egidio is a rather unpleasant “Catholic” group involved in modernism, ecumenism, socialism—and just about every negative ism imaginable. 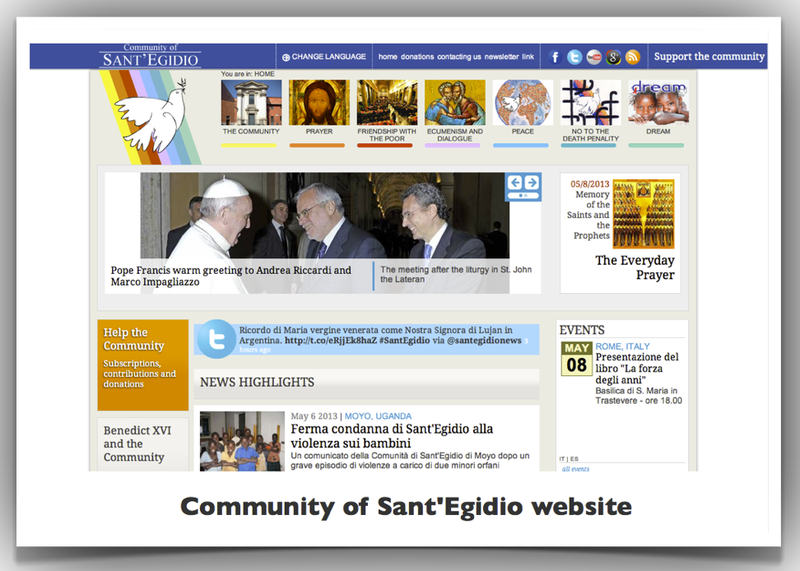 Notice the “rainbow” banner under the faux Pablo Picasso dove of peace, on the Community of Sant’Egidio website. The folks at this community probably claim that the rainbow stands for “peace.” Others know better. Gianni Valente is the former China “specialist” at 30 Days– a publication under the direction of Giulio Andreotti which folded its tent after their 5/2012 issue. Andreotti, who died on May 6 at the age of 94, was a “lifetime Senator” and eternal politician, who served as Prime Minister of Italy under the now-defunct Democrazia Cristiana — the “catch-all” political party of compromise, that embraced the left, the right and everything in between. Democrazia Cristiana ended in a fireball of corruption. Ah… but Andreotti’s “intellectual” reflections and suggestions– as well as those of Gianni Valente and others– have been devoured for many years, during breakfast, lunch and dinner, at the tables of the Roman Curia and by Bishops around the world. It looks like Cardinal Zen has been an avid reader– or he wouldn’t be wasting his time writing open letters to a writer at 30 Days. Why was this publication so popular among prelates? Because Andreotti and his 30 Days represented the “pragmatic” approach of Vatican II: compromise! This reality devoid of principles has been pervasive and persistent in “intellectual” and “religious” Roman circles, for decades. So the Community of Sant’Egidio and Gianni Valente are simply a reflection of this environment, as they happily display their support for compromised members of the Church in China. The fact that Cardinal Zen would waste his time addressing the Community of Sant’Egidio and Gianni Valente, is a perfect example of how even prelates who are familiar with Communism, are blinded by Vatican II’s political correctness– and will continue to collaborate and dialogue with antagonists. Francis’s friendship with Gianni Valente and his wife will be discussed further below. Please accept this as a kind recommendation– since most of us who have actually suffered the horrors of Communism would characterize your dialogue with socialists, as clueless. 2. 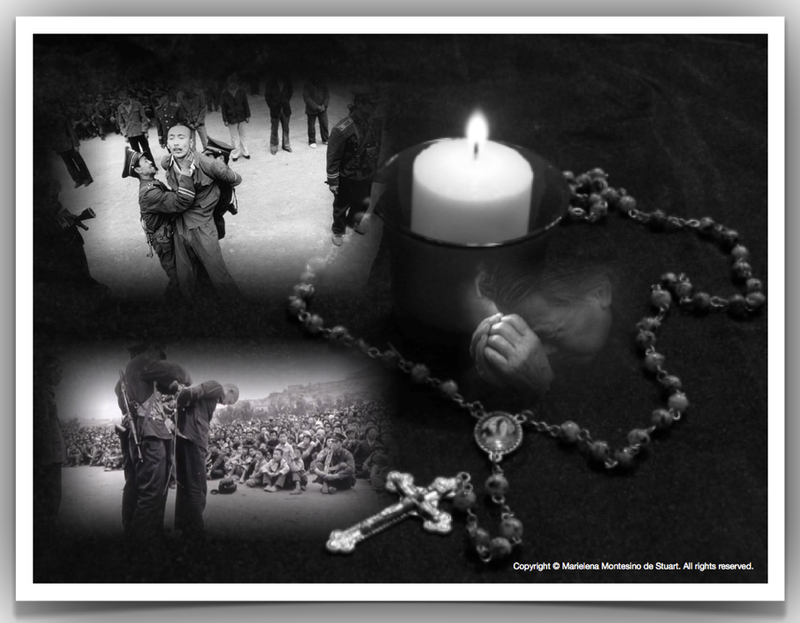 Stop defending Benedict XVI’s 2007 letter and the 2009 Compendium– which constitute a betrayal of martyrs and faithful Catholics in the Underground Church in China. Instead, start vigorously denouncing Vatican II and its supporters, as the main obstacle preventing the effective defense of the Underground Church in China. In doing so, you may also help to lift the yoke of Communist oppression for Catholics in Cuba– who have been subjected to more than 50 years of Vatican “dialogue” with the Castro regime. 3. Recognize that the current modernist hierarchy in Rome is in a state of free fall– and is incapable of helping the Underground Church in China, as evidenced by Benedict XVI’s 2007 letter to the Catholics in China, followed by his Compendium in 2009– under the useless rules of rapprochement of Vatican II, regarding Communism. 4. Please let the members of the Underground Church in China know that they are not alone. The modernist practices embraced under Vatican II have fractured Catholics into underground and above-ground groups– who will no longer tolerate further transgressions and heresies, committed in the name of Holy Mother Church. Sadly, many innocent and well-intentioned Catholics have also become victims of cults and sects, in their desperate attempt to distance themselves from the Church’s modernist problems. As a Roman Catholic who survived persecution by the Communists in Cuba, the only thing I have ever needed is the One True, Holy Catholic and Apostolic Church that Our Lord Jesus Christ founded. It is the path of embracing the Cross– but it is the only authentic path– and the one that the members of the Underground Church in China must follow. The Underground Church in China needs your support, Cardinal Zen, in the vigorous promotion of the Latin Mass (the only true Mass centered on the Eucharist) as the authentic expression of reverence and respect for Holy Mother Church. The Latin Mass will allow Catholics in China to be united linguistically with Catholics all over the world– through the authentic universal language of the Church: Latin. You are in a perfect position to take on this task– having been a member of the Congregation for Divine Worship and the Discipline of the Sacraments. 5. As a Prince of the Church, it is your duty to expose the dysfunction of the Congregation for the Evangelization of Peoples– which directly affects the Underground Catholic Church in China, as well as the entire world. “I have not baptized a single person, though some wanted to become Christians,” said Swami Shilananda. “They hesitated when they were told that conversion is not external, but a change to live the true life of Christ, serving the poor and downtrodden people,” he explained. UCANews.com, October 5, 2004. “Father Peter Dias, vicar general of Nashik diocese, says the Jesuit ascetic “lives an effective witness to evangelization, and simple villagers appreciate Christians because of him.” Swami Shilananda’s ashram falls under the diocese. The Congregation for the Evangelization of Peoples has turned into a group of misguided “intellectuals” with advanced degrees in socialism, who participate in the equally misguided ecumenical vision of Vatican II– without any serious intention to propagate the faith– which was the intent of its founder, Pope Gregory XV, who originally named this body the Sacred Congregation for the Propagation of the Faith. The dysfunction of the Congregation for the Evangelization of Peoples is also greatly manifested in the failure to carry out missionary activity inside Russia. A perfect example of this was Cardinal Dionigi Tettamanzi’s disturbing statement in Moscow on October 2006, where he apologized for the work performed by Catholic missionaries in Russia, from the standpoint of ecumenism. What is the result today, Cardinal Zen? On May 10 Patriarch Kirill met with the Communist President of China, Xi Jinping, to obtain the “blessing” of the Communist Party for the Russian Orthodox Church in China. This is exactly what Our Lady of Fátima warned would happen. The reality is that China, as a monstrous Communist / atheist entity, is dictating the religious practices of millions of people– while the Holy See “dialogues” and acquiesces to the Chinese government’s demands. It must be noted that China’s power and influence extends throughout Eurasia– and he who controls Eurasia, controls the world. The abysmal record of evangelization through ecumenical practices under Vatican II, cannot withstand the force and control that Beijing is already exerting over the religious practices of millions of people. This is not only a threat to the Underground Catholics in China– but to humanity, considering that officials at the Holy See have a powerful diplomatic corps at their disposal– which can promote worldwide religious compromise and cooperation, with the Communists in Beijing. The numbers presented to Francis on the Pontifical Yearbook 2013 do not look good— showing basically no growth in the world’s Catholic population, as a percentage of the world’s population. But even Vatican officials do not trust the numbers on the yearbook, as explained by Enrico Nenna, the chief statistician in the Vatican’s Central Office for Church Statistics, who stated on August 17, 2012 that the working document for the world Synod of Bishops on the new evangelization contains more than a dozen references to a “weakening of faith” or “declining practice.” [Italics added for emphasis]. “One problem with the census, Nenna said, is that not every bishop is careful filling out the forms and, in most situations, Catholics who stop going to church do not formally leave, so they are still counted as members.” Catholic News Service (CNS) August 17, 2012. Upon examination of the numbers, it is evident that this “new evangelization” of Vatican II simply does not work– and cannot keep up with the monumental force of materialistic atheism all over the world. It is absurd for the modernist Church to continue this “new evangelization” (a pan-religious practice based on ecumenism, which has nothing to do with authentic Catholicism). The numbers do not look good in the United States either. It is the influx of people from other countries coming to the U.S., which has rescued the population of Catholics, as was clearly outlined in this Catholic News Service report. Excerpt: “Catholic numbers and percentages rose in many states in the South and West mainly due to immigration.” [Bold added for emphasis]. It is also not surprising that The North American Forum on the Catechumenate, which ran the RCIA (Rite of Christian Initiation of Adults) quietly announced earlier this month it would dissolve by June 30, 2013, for financial reasons– after 30 years. Cardinal Zen, bringing the Congregation for the Evangelization of Peoples back to its original Sacred mission of propagation of the faith is critical for the Underground Church in China, along with the celebration of the Latin Mass. 6. Gather support for the dismantling of the current Secretariat of State office, led by Cardinal Tarcisio Bertone. It has turned into nothing but an untrustworthy entity, which serves poorly prepared “diplomatic” dishes every day, cooked by arrogant socialists, like Bertone– who thinks that he can continue to dish out his repugnant hypocrisy. 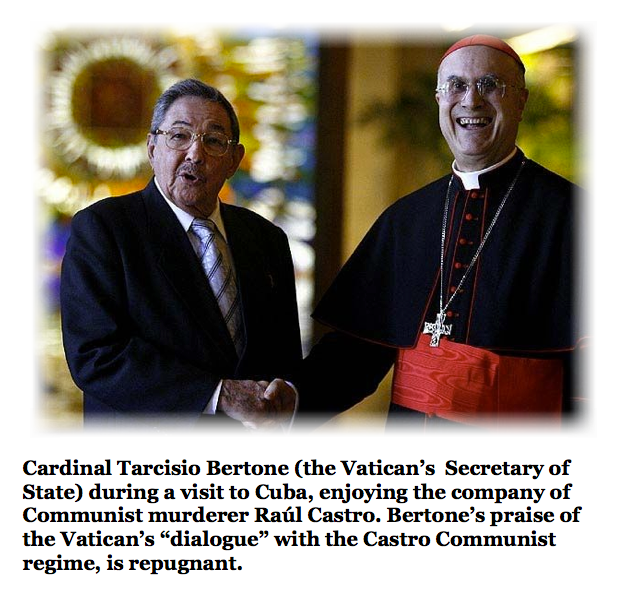 Bertone has offended the Cuban people by denying that Communists are persecuting Catholics in Cuba. He did not even care to request amnesty for political prisoners, after meeting and enjoying the company of the murderous Castro brothers. He is the perfect example of the bitter “fruit” of Vatican II. 7. Finally, Cardinal Zen, if anyone accuses you of being an isolationist because you decide to follow the above recommendations– remind them that Rome has isolated itself from its flock by allowing secularism (modernism) to take over. The greatness of the Roman Catholic Church cannot be manifested– when socialists, pederasts (and their protectors) cowards, liars and thieves, are breaking bread with you. At this point, Cardinal Zen also needs to focus on Francis and the company he keeps. If Cardinal Zen is upset at Gianni Valente in 30 Days— then a close look at Francis’s associations would give the Cardinal even more to worry about. By now, Cardinal Zen must be aware of Francis’s close friendship with Gianni Valente and his wife, Stefania Falasca, who collaborated with her husband, as a former editor of 30 Days. Stefania Falasca is known in Roman circles as “l’amica-giornalista del Papa“ (“the Pope’s journalist friend”). 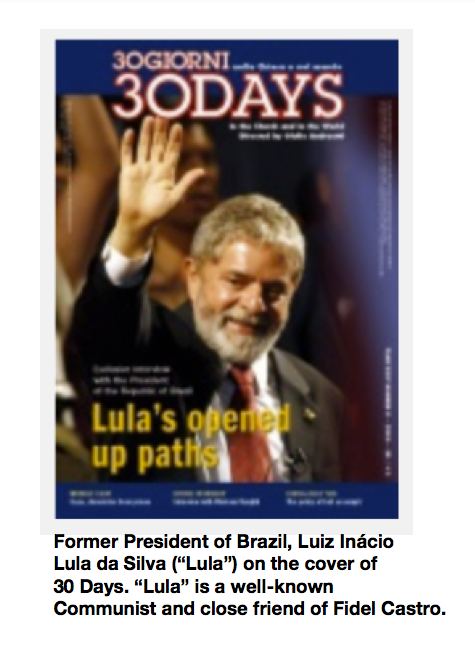 As a “feather in her cap” she has interviewed Communists like the former President of Brazil, Luiz Inácio Lula da Silva (known as “Lula”)– featured on the 9/2006 cover of 30 Days. One of the first things that Bergoglio did after becoming Francis, was to call the Valente-Falasca home, to chat. I consider the Valente-Falasca team to be your typical “progressive Catholic journalists”—looking for “dialogues” in every corner—including those located at the intersection outside the Communist headquarters in Beijing. To make matters worse, remember that Francis’s “horse whisperer” is none other than Cardinal Cláudio Hummes—whose Communist political activism is legendary, in the land of Bossa Nova. Since 1962, the orchestrators and followers of Vatican II have done nothing but provide lip service and empty promises to people oppressed under Communist regimes. This has turned into a long string of embarrassing compromises– often with tragic consequences. China and Cuba are perfect examples of this. The rules of conduct and marching orders of Vatican II do not allow confrontation with Communism– only “dialogue.” The faithful Catholics in the Underground Church in China will continue to bear this Cross, in spite of their loyalty to the Holy See. Tragically, the combination of Francis’s loyalty to Vatican II— and the socialist company he keeps (including the “horse whisperer”) may bring about even more difficulties for millions of Underground Catholics in China. DISCUSSION: The Underground Church in China,”Pope” Francis Watch, Beijing, Cardinal Cláudio Hummes, Cardinal Joseph Zen Ze-kiun, China, Chinese Catholic Patriotic Association, Città del Vaticano, Hong Kong,Vatican City, Vatican II, Rome, Holy See.